Bob B. Soxx and the Blue Jeans was formed in 1963 in New York City, New York. 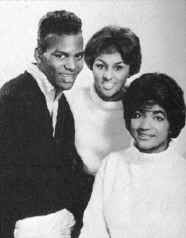 The trio consisted of Bob B. Soxx (Robert Sheen), Fanita James and Darlene Love. Sheen was born about 1942 in St. Louis, with his family moving to Los Angeles while he was just a boy. Taken with the R&B scene, he started haunting the offices of Specialty Records as a teen. Soon he was singing with the Robins and Marvin and Johnny. In the summer of 1962, Sheen had solo single "How Can We Ever Be Together" on Liberty which did nothing. A Fairfax High School classmate, Phil Spector remembered him when he started Philles Records in 1962. Sheen became one of the many the local vocalist backing the Crystals, with Darlene Love (Darlene Wright), and Fanita James. It was in that year that the group had their only big hit a swinging version of "Zip-A-Dee-Doo-Dah" (#8), a song from the Disney film Song of the South. Spector had been initially attracted to Sheen because his voiced reminded him of Clyde McPhatter's. All of the Blue Jeans had been singing since their early teens and Love and James were members of the Blossoms that Spector was already recording. Though they only had three chart hits, the group was a mainstay of the rock and roll concert circuit from 1963 to 1965. Sheen went back to a solo career recording for Dimension (19650, Capitol (1966-1969), Warner Brothers ((1972-1973), and Chelsea (1973) with no success. He passed away on November 23, 2000. Love went on to have some hits of her own for Spector. Love and James were a backup vocalists for Tom Jones in the early '70s and James continued to lead a group of Blossoms through the '80s.